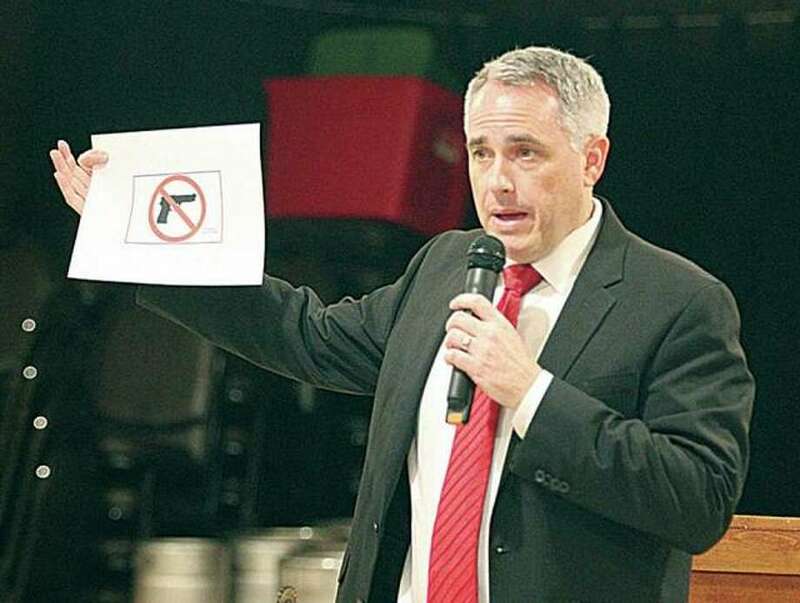 In this April 2016 file photo, Madison County State’s Attorney Tom Gibbons holds a copy of the “magic sign” that must be displayed to prohibit people with concealed carry permits from taking firearms into a building. EDWARDSVILLE — In advance of a “pro-gun rally” set to be held outside the Madison County Courthouse next week, Madison County State’s Attorney Tom Gibbons on Thursday said he will support citizens’ rights to concealed carry in the county, specifically on the sidewalks and courtyard areas around the county’s Administration Building and Courthouse. “Together with Madison County Sheriff John Lakin, I am proud to support the rights of citizens to protect themselves, their families and our community by the free exercise of their Second Amendment rights, as provided for in the Illinois Firearm Concealed Carry Act,” Gibbons said in a news release Thursday. The Madison County Friends of the Second Amendment have planned a “pro-gun rally” between the Courthouse and Administration Building for 3:30 p.m. Thursday, Oct. 25. Several speakers will talk in support of the right to concealed carry, and pro-Second Amendment groups will have representatives at the rally. In June, the County Board approved placing a referendum on the ballot making Madison County a “sanctuary county” for gun owners, although some board members expressed opposition. On Thursday, Gibbons cited previous case law in support of his opinion regarding the matter. Lives saved by "no guns" signs to date: ZERO. Frequently spotted on nightly news shows locations of shootings and ironically the sign can be found often. Together with Madison County Sheriff John Lakin, I am proud to support the rights of citizens to protect themselves, their families and our community by the free exercise of their Second Amendment rights, as provided for in the Illinois Firearm Concealed Carry Act,” Gibbons said in a news release Thursday. The Madison County Friends of the Second Amendment have planned a “pro-gun rally” between the Courthouse and Administration Building for 3:30 p.m. Thursday, Oct. 25. This whole gun sanctuary garbage is garbage. What’s stopping the attorney general from pressing charges? She is too busy in her relentless pursuit of corruption in state government to stoop to bothering with anything in the Metro East area. Maybe the Madison County Courthouse and Administration building could have lockers for people to lock up their handguns.